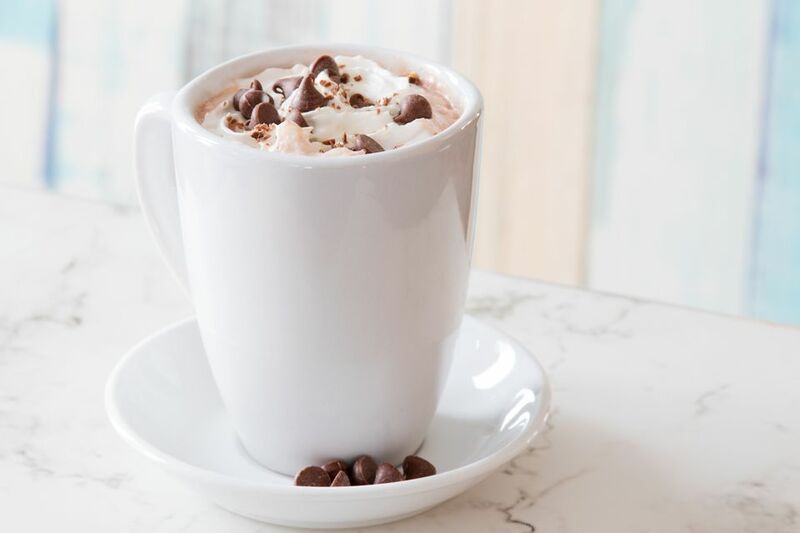 The chocolate kiss is a wonderful spiked hot chocolate drink that will warm you up in no time. Delicious and comforting, this recipe is easy to make and a fantastic way to dress up your favorite cup of cocoa. The recipe is a variation on the simple adult hot chocolate. It adds a touch of coffee liqueur to the tempting chocolate-mint combination, giving the drink a deeper flavor profile. When you really want a treat, finish it up with a healthy mound of whipped cream and crown it with a Hershey's Kiss! In a pre-heated mug or Irish coffee glass, pour the peppermint schnapps and coffee liqueur. Fill with hot chocolate and stir well. Garnish with whipped cream and a Hershey's Kiss or a few chocolate chips. As with any hot cocktail, your drink will stay warmer longer if you warm up your glass. Simply pour hot water in it while making the cocoa or microwave a water-filled glass for about 10 seconds. Dump out the water before building your drink. Any hot chocolate recipe works wonderfully for the chocolate kiss recipe. Whether you enjoy a powdered cocoa mix or rich, melted chocolate, pour your favorite. Some peppermint schnapps has a really strong flavor, especially those that are 100-proof like Rumple Minze. If you're pouring one of those, consider backing off a little so the drink doesn't become too minty. When it comes to coffee liqueurs, Kahlua is probably the first brand that comes to mind. However, there are many other great options to explore. A few suggestions are those from Firelit, Leopold Bros., St. George Spirits, and New Deal. The easiest whipped cream to use when topping drinks is a canned version, such as Reddi Wip. If you want to get crafty and enjoy the freshest whipped cream, make your own. For this drink, it would be fun to add a little mint or vanilla extract into the cream for extra flavor. Chocolate cocktails are a great excuse to add all sorts of indulgent garnishes. Beyond the cream and chocolate, you might want to use mini marshmallows, drizzle a little chocolate or sprinkle cocoa powder on top, or hang a candy cane on the rim. For a drink that is a little stronger, replace the coffee liqueur with an espresso-infused vodka like those from Three Olives or Van Gogh. If you don't have coffee liqueur in stock, you can use some regular coffee instead. Instant coffee granules are one possibility, or you can pour a little fresh-brewed coffee or espresso for an extra kick. How Strong Is a Chocolate Kiss? Unless you pour a 100-proof schnapps, the chocolate kiss is going to be a very mild cocktail. With the average 30-proof liqueurs, the drink's alcohol content is only 3 percent ABV (6 proof), give or take. That is less than most beer. If you go with the stronger schnapps, you're still looking at just 10 percent ABV (20 proof), which is like drinking a glass of wine, only yummier! Beware, though, the higher alcohol content also ramps up the minty-flavor. It may be too much for some tastes.